Elle had been raving about the falafels at La Panthère Verte, so when the opportunity came to purchase a Groupon ($10 for $20 worth of food), I jumped at it. 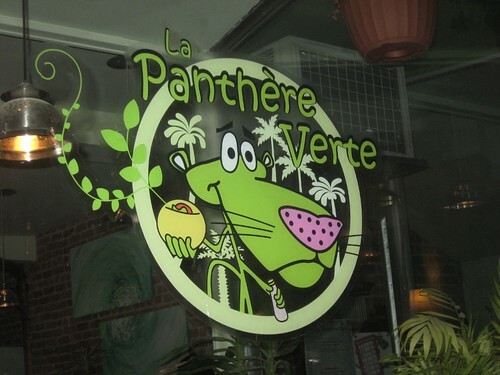 Not only is La Panthère Verte a vegan restaurant, but it's also very environmentally conscious. They try to minimize trash, and even have a bin for organic waste (since moving to Montréal, I really have missed my green bin for organic waste). Elle and I each got a boules dorées sandwich ($5.99); the golden balls allude to Yemen style falafels. 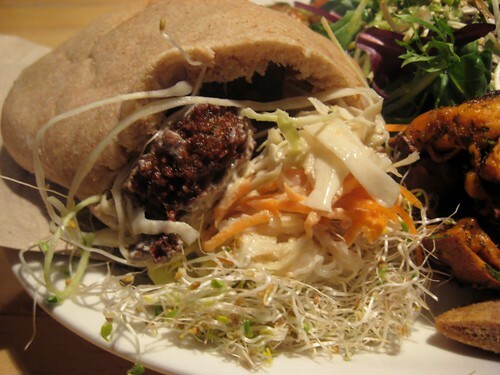 The pita is stuffed with crispy falafels, cabbage and sprouts - all of it drizzled with tahini sauce. The pita seemed a bit thick to me but Elle thought they were made in house, so that's forgivable. For one of the sandwiches, we shared a platter (I think it was $9.99) that was served with a variety of salads available on that day. We both agreed that our favourite was the sweet potato salad but I also really liked the quinoa, that was also topped with tahini sauce. 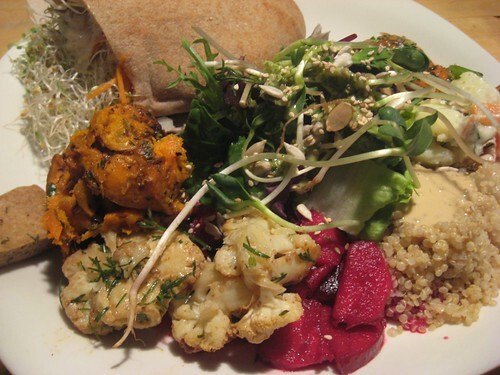 This is a great spot for a vegan meal, or really any meal. I would go there in a second for more falafels. Conveniently, they've opened up a second location on Mackay Street downdown.